Just wanted to say that everyone had a fantastic weekend, from beginning to end. 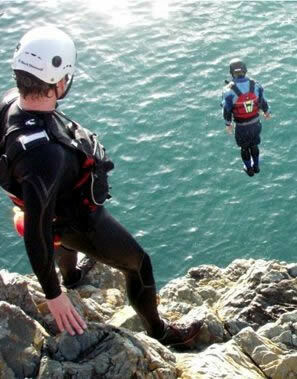 The coasteering was, by far and away the best activity, and the event that everyone is still talking about. Thanks for making it so easy for me to organise such a memorable weekend. I just wanted to drop you a quick line to let you know what a fantastic weekend you organised for us last week. 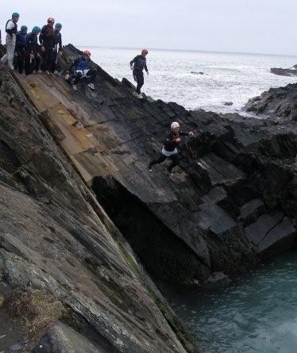 All the girls have raved about the coasteering which went down a storm. 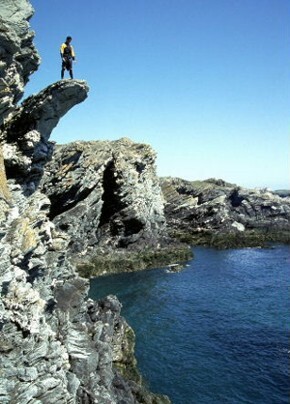 I don't think any of us envisaged jumping of 30ft cliffs into the sea, but are all keen to do it again soon. We'll be sure to recommend your services. Just a quick note to say thanks for such an excellent weekend we couldn't have asked for more. Everything from the chauffer driven minibus to the coasteering was a rip roaring success. I will certainly be recommending you to others, thanks a lot. I am nearly 50, overweight and feeling old but just had a fantastic weekend Coastering. Special thanks to Vicky for being so kind. Just wanted to drop you a quick line to say thank you for all your help organising the week-end. Everyone seemed to enjoy themselves and i would certainly recommend coasteering as a hangover cure! Just a quick one to say thanks for looking after our party at short notice on Saturday afternoon. Coasteering was fantastic. The boys were brilliant and even got my wife to jump off a high ledge! something I haven't been able to get her to do for 15 years... See you next year mate. Coaststeering was fantastic never done anything like it. Would recommend the weekend to anyone. I'm sure your here from us soon Thanks again. There was definitely a lot of apprehension from the group before the coasteering but everyone loved it once we were in the sea. Thanks for organising a great weekend. I would like to take the opportunity to thank you and all your staff for a brilliant afternoon from myself Steve, and my partner Dan, we are still grinning, and telling everyone how fantastic the experience was, once again thank you, and we look forward to seeing you all again. PS. Please email myself of any more events, we will come back!!!!!!!! 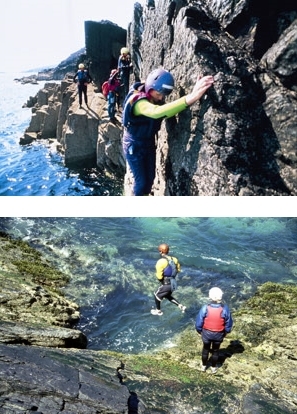 The coasteering was brilliant. Definitely the highlight of the weekend. The leaders knew their stuff and didn't put anyone too far out of their comfort zone. It was largely agreed that given the chance we would all have gone back to Pembrokeshire for another session!! 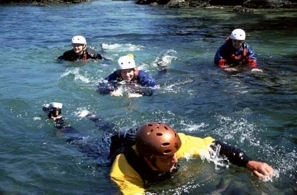 Chris, thanks for organising all of this at such short notice, the coasteering was brilliant and we had a great time getting wet with our two teenage boys! Please email us or use the form provided so we can check availability for you (don't forget to include your mobile number). Alternatively telephone Chris or Abbi on 07919 244549 or 01559 363911 to make your booking. If you email us and have not heard back from us with more information within 24hrs then it is likely there has been a mail delivery problem at your end. In this event please call us and we will be happy to take your enquiry over the phone.